James McNulty came over from Ireland, opening his first shoe shop in Scholes, Wigan in 1858. James secured a contract to make boots for the Wigan Coal & Iron Company. In 1900, Library Street was being built in Wigan town centre. James purchased the shop at 31 Library Street now having two shops within the Wigan area. James asked his son Robert (Snr) to manage the Library Street shop. James died in 1922. The businesses continued to grow strong in Scholes and Library Street. Around the 1950’s Scholes was redeveloped, so the shop there had to go. Unfortunately Robert (Snr) died in 1954, the management of the business passed to his two sons Robert and Patrick. The business in Library Street expanded into number 29. In the early 1970’s the shop was modernised having an external and internal refurbishment. 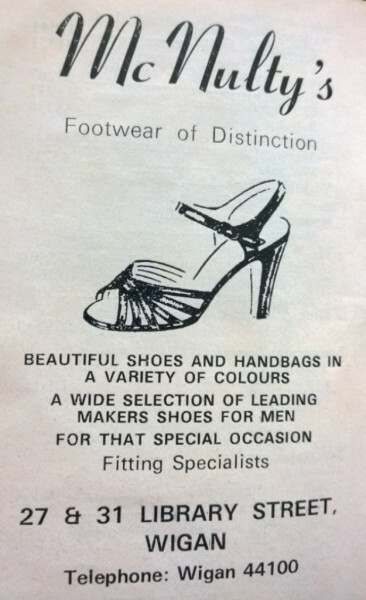 Within this era the business sold the famous ‘Royal’ a classic hardwearing brogue which proved popular with young people as a great school shoe (remember the metal segs in the heels). The business sold high class ladies shoes with matching handbags for special occasion’s brands such as Renate and Gina Shoes. The shop reverted to its original premises at 31 Library Street having an original wooden shop frontage installed. Today we have the fourth generation of the family running the business. Brothers Patrick and Shaun who are looking to keep the family name going for another one hundred years! We would like to thank all our loyal customers who support McNulty’s Shoes as we continue to sell stylish footwear for all occasions.